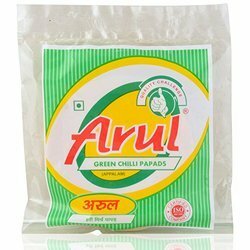 Based in Chennai (India), we, Arul Appalam Depot, are engaged in manufacturing and export of Chilli Pappadum Papads that are used along with many food items as snacks or side dish. Widely preferred amongst people who have taste buds for chillies, the variety of Crushed Red Chilli Pappadums and Green Chilli Pappadums that we have in offer is sure to impress them with taste and flavor both. Further, we also make sure that each order placed with us is completed in time at our hygienic processing facility to ensure that only a qualitative products is reached to the clients. You can avail from us Crushed Red Chili Appalam. Ensuring great taste and aroma, these are widely preferred amongst our buyers for long shelf life and quality. A fine get along dish with biryanis or pulaos, our clients can savour its taste with any kind of sweet dip. We offer Green Chilli Papad/Pappadums that are made from fresh green chillies that are hand-picked and ensure freshness. Served with choice of chutneys, these green chilli papadums are a great companion to the traditional Indian main course making the platter complete and satisfying. 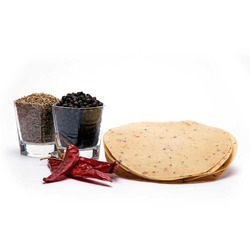 We make use of qualitative ingredients in the preparation of Green Chili Pappadums a that are available to our buyers in specified quantity as per their request at best prices in the industry.